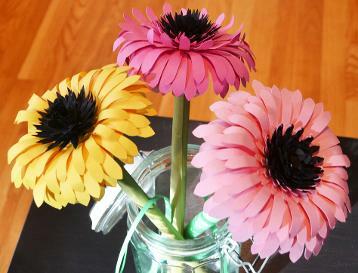 Together we will create 5 paper gerbera daisy flowers in your choice of colors - yellow, pink, white or lavender (not pictured) or multicolored (all 4). Class fee of $40 includes all supplies, wine and snacks. Glue guns will be provided but feel free to bring your own. Please state which color daisy you would like to create when registering for class. A deposit of $15.00 is due at least 3 days before class. Deposit is non-refundable unless the minimum of 4 people is not reached 3 days prior to class. At that time your deposit will be refunded and the class will be cancelled. If you can't make this class but would like a fun night out book a private class. See the Sip and Craft/Paint Parties section on this page!